Basboussa, a traditional Arabic dessert. 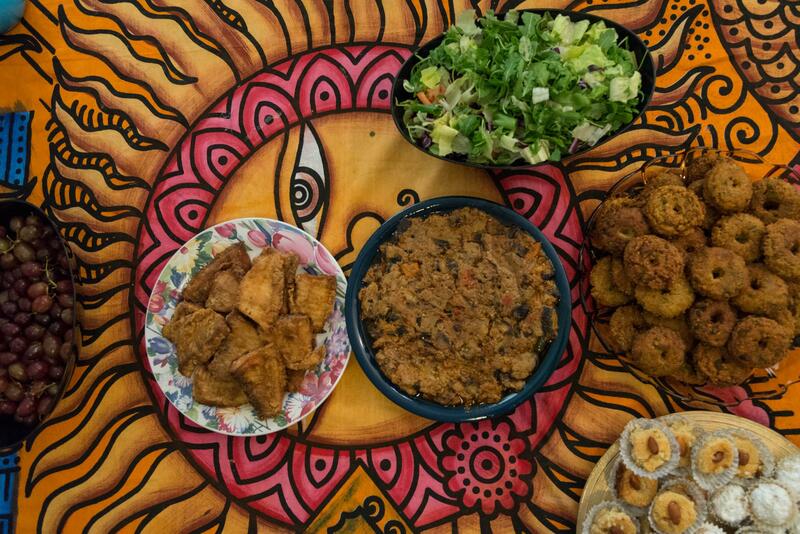 The dining room table in her New Haven apartment was set with a colorful African cloth and a Sudanese feast. Ahmed’s 11-year-old daughter Lames described what was on the table. “Fish, eggplant, falafel, and basbousa,” which is a traditional sweet cake made from semolina, flour, sugar, oil, and topped with almonds. Lames, who arrived with her family from Sudan three years ago speaking only Arabic, is now very comfortable with English. But, she says, it took time to adjust to American food. At first, her mom sent Lames to school with bagged lunches to be sure that the food was “halal,” or in line with Islamic law. Once they were confident, “I just ate the school lunch,” she said. When asked if she liked it, “not much,” was the quick reply. Ahmed’s husband, Fouad said there are a lot of different foods according to the regions. “In north Sudan,” he said, “there’s a kind of different food from Nuba Mountains,” which is where he’s from. The Nuba Mountain region has suffered tremendously in a long ongoing civil war. 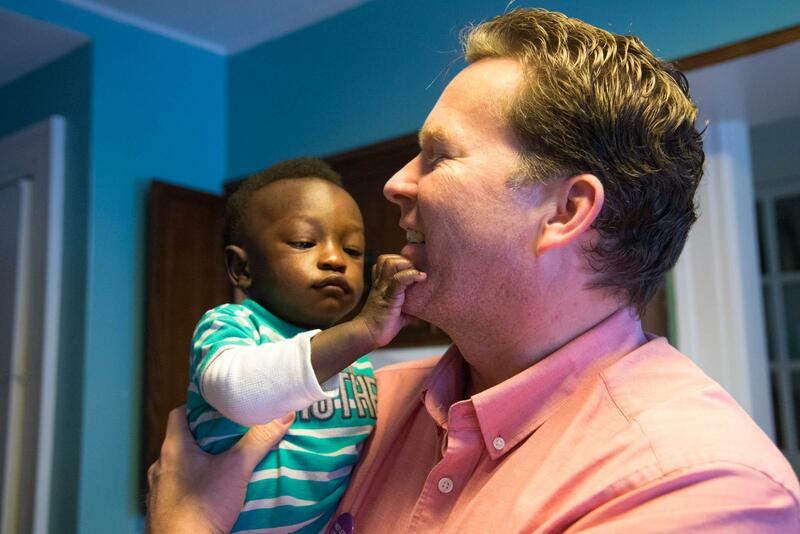 The family fled the violence in Sudan and waited years to be approved to come to the U.S. They resettled in New Haven with the help of Integrated Refugee and Immigrant Services. Will Kneerim directs employment and education at IRIS. He said food plays a huge role in welcoming refugees when they first arrive. Lames said the family plans to spend the Thanksgiving holiday with American friends. They’ll eat a traditional meal with turkey and stuffing. And Lames said she likes most of it (especially the desserts), but she’s not a fan of cranberries. “Too sour,” she said, which sounds like the opinion of most 11-year-olds in America, whether they were born in the U.S., Sudan, or just about anywhere else. President Trump and televised spectacle go together like peas and carrots. 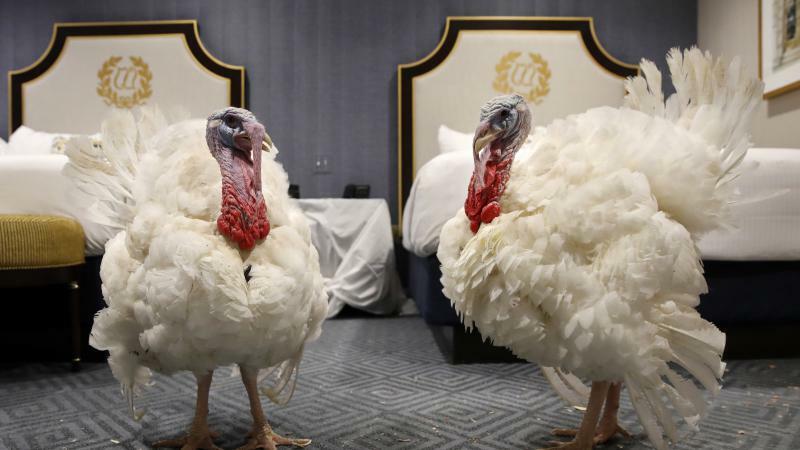 And those just happen to be the names of the unflappable turkeys that Trump pardoned — on camera — Tuesday afternoon.